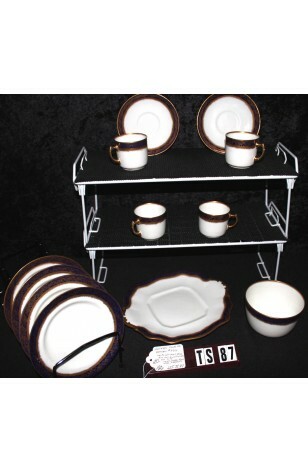 Antique - Adderley's China Ltd., Partial 12-Piece Tea Set, Cobalt and 22kt Gold, Pattern #9563, Circa 1906-1929. Beautiful Small Tea Set by Adderley's China Ltd, England, Pattern #9563, A Bright White China with a Band of Cobalt Blue below the Rim, in which 22kt Gold Pattern of Flowers, Dots and Filigree are Hand Painted. All Rims are in 22kt Gold, Cup Handles and Handles on Sandwich Plates are 22kt Gold, as well as 22kt Gold Strip beneath the Cobalt Band. All Gold could be either 22kt or 24kt, we are uncertain. Missing 2-Saucers and 1-Creamer. A very Striking Set on anyone's table. Good Resale Condition unless noted below or in pictures. 2 - Saucers - 5 7/8"